Definition (SNOMEDCT_US) Disease of the heart muscle associated with electrical or mechanical dysfunction, in which the heart is the sole or predominantly involved organ. Definition (SCTSPA) Enfermedad del músculo cardíaco asociado con una disfunción eléctrica o mecánica, en la cual el corazón es el único órgano afectado o el comprometido en forma predominante. Definition (NCI) A disease of the heart muscle or myocardium proper whose cause is unknown. Cardiomyopathy is the name for diseases of the heart muscle. These diseases enlarge your heart muscle or make it thicker and more rigid than normal. In rare cases, scar tissue replaces the muscle tissue. Heart attacks, high blood pressure, infections, and other diseases can all cause cardiomyopathy. Some types of cardiomyopathy run in families. In many people, however, the cause is unknown. Treatment might involve medicines, surgery, other medical procedures, and lifestyle changes. Definition (NCI_CDISC) A disease of the heart muscle or myocardium proper. Cardiomyopathies may be classified as either primary or secondary, on the basis of etiology, or on the pathophysiology of the lesion: hypertrophic, dilated, or restrictive. Definition (NCI) A disease of the heart muscle or myocardium proper. Cardiomyopathies may be classified as either primary or secondary, on the basis of etiology, or on the pathophysiology of the lesion: hypertrophic, dilated, or restrictive. Definition (MSH) A group of diseases in which the dominant feature is the involvement of the CARDIAC MUSCLE itself. 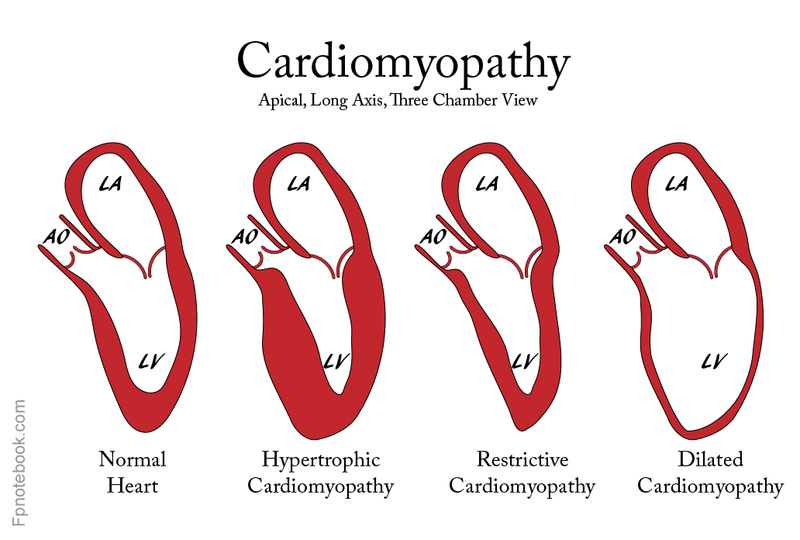 Cardiomyopathies are classified according to their predominant pathophysiological features (DILATED CARDIOMYOPATHY; HYPERTROPHIC CARDIOMYOPATHY; RESTRICTIVE CARDIOMYOPATHY) or their etiological/pathological factors (CARDIOMYOPATHY, ALCOHOLIC; ENDOCARDIAL FIBROELASTOSIS). Definition (CSP) condition in which there is a deviation from or interruption of the normal structure or function of the myocardium, the middle and thickest layer of the heart wall, composed of heart muscle. This page was written by Scott Moses, MD, last revised on 11/18/2018 and last published on 4/6/2019.